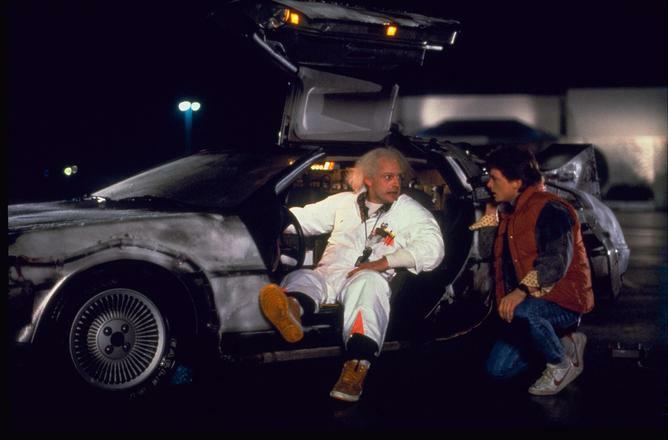 Thirty years after Back to The Future was released, the story of how former General Motors executive John Z. DeLorean failed in his ambition to make a commercial success of his futuristic car still revs at the heart-strings. Marty McFly: Wait a minute, Doc. Are you telling me that you built a time machine… out of a DeLorean? Dr. Emmett Brown:“The way I see it, if you’re gonna build a time machine into a car, why not do it with some style? – Back To The Future, 1985. The iconic DeLorean car was written off as a failure after its release in the 1980. But Hollywood saved it. Today, the iconic DeLorean sports car is probably better known as the fictional time machine from the Back to the Future movies than for its motoring prowess. Few people would remember that the car with iconic gullwing doors but no time travel capability went on general sale in the early 1980s. Out of the 9000 made, only 6500 are still around. A few exist even in Cape Town, and are available to rent for the wealthy or for hire to use in movies shot in the city. It is among the classic car collection available to rent for US$38,481 a year at an exclusive dealership in Cape Town. But the true story of the DeLorean is how the company became one of the biggest-ever business disasters, even with a generous subsidy from British taxpayers. It failed despite the involvement of DeLorean, successful car designer Giorgetto Giugiaro, and Formula One engineering expert Colin Chapman of Lotus. After almost 20 years in the automotive industry as a designer and after becoming the youngest vice-president of General Motors at the age of 40, DeLorean resigned from his position in 1973 to pursue his own venture. The DeLorean Motor Company was established to produce his “dream-car”, with an eye on the US market. The DeLorean DMC-12 was unusual. It had lift-up gullwing doors, which had been applied to date only to a few other sports cars with modest commercial results. To cast his car’s style in history, DeLorean commissioned the design from Giugiaro. The first prototype was unveiled in 1977 in New Orleans to raise interest and attract investors. DeLorean managed to raise around US$10 million by selling part of the company’s shares to 343 dealers, and US$1 million from individual investors. Almost US$100 million was raised from the British government via the Northern Ireland Development Agency and the Department of Commerce. This was given under the promise to create 2500 new jobs in Dunmurry, Belfast. The aim was to reach a production of 30,000 cars a year. DeLorean hired Chapman from Lotus to come up with an engineering solution for the car in 18 months. Lotus' involvement in Formula 1 had given DeLorean hope of a quick development time and innovative engineering that would come from sharing the same “father”. As a result, Lotus Esprit and DMC-12 could enjoy similar technological solutions. DeLorean made it to market in 1981. But despite looking similar to the original 1976 prototype, it compromised on many technological solutions. For example, the composite plastic monocoque and the mid-engine were substituted with a steel backbone chassis-frame and a rear-engine. Critics complained that the car under-delivered, handled poorly, and performance was not great – especially considering the high US$25,000 price tag. The negative rumours escalated to even claiming false considerations, such as that gullwing doors were impossible to open in tight spaces when it was proven that they actually needed less space than regular doors to open. In 1982, DeLorean filed for bankruptcy. Things were going to get worse. In October 1982 DeLorean was arrested for cocaine smuggling. Investigations into his firm’s finances revealed that US$17.5 million of money from the British investment had disappeared, allegedly to pay Lotus via “GDP”, a Swiss Panama-based firm. Still, Lotus claimed to have never received that money. But Chapman, one of the few people who would have been able to explain what happened with GDP, died before being interviewed. Against all expectations, and despite the many shadows still unresolved in his cases, DeLorean was found not guilty on both drug and fraud charges. A life of personal and professional highs and lows followed until his death from a stroke in 2005. That the car starred in the Back to the Future trilogy was fortuitous for DeLorean. In the original screenplay the time machine was going to resemble a refrigerator until director Robert Zemeckis abandoned the idea because he was afraid children would have locked themselves in their home fridge. Funnily enough, the DeLorean DMC-12 was picked ahead of other cars despite being the disgraced product of a failing company. Ironically, the weirdly futuristic look of its stainless steel panels and gullwing doors, and the unusual and perhaps unreasonable characteristics that made it a market failure, created the basis to make it a movie icon. The DeLorean Motor Company has reappeared as a second-hand dealer which provides spare parts and after-sale service, as well as the possibility to rent time machine replicas. Also, the huge renewal of interest for exclusive gadgets inspired by Back to the Future – such as the Nike Air Mag and the geeky attempt to invent flying technologies such as the Lexus Hoverboard – might provide the market conditions for a launch of a DMC-12 restyling. But similar to all the other famous predictions seen in the movie, to really know whether a new DeLorean might possibly “fly” with tomorrow’s consumers, we might need to ask “Doc” to bring us back to the future once again.